Last night the Dowry Creek owners had a pot luck beer-can chicken dinner that was really fun. To make beer can chicken you stuff an open can of beer in the chicken and barbeque it. It was really moist and good. We left the marina early to take advantage of the low winds on the Pungo River. There was a long canal that connected the Pungo to the Alligator River. 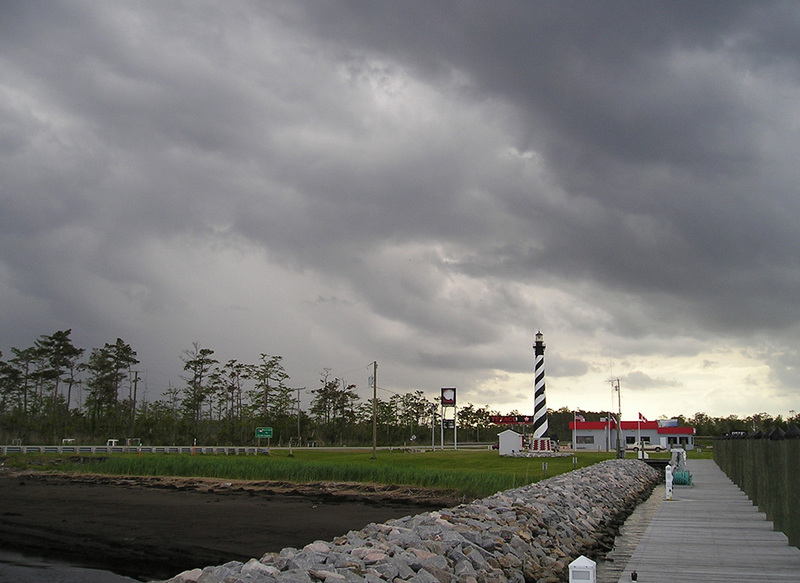 The Alligator River was 4 miles wide and we had a following sea with 2-4 foot waves to the highway 64 swing bridge. The bridge only opens if the winds are below 35 miles an hour and marina was on the other side of the bridge so we had to get through to get shelter. Fortunately the winds weren't so high and after a 10 minute wait we got through and into the safe harbor at the Alligator River Marina. We got there about 12:30 so to avoid the thunderstorms and rain that were forecast for the afternoon and evening (see photo). We got lots of rain but no thunderstorm that night. Cell phone coverage has been non existent since Beaufort NC.